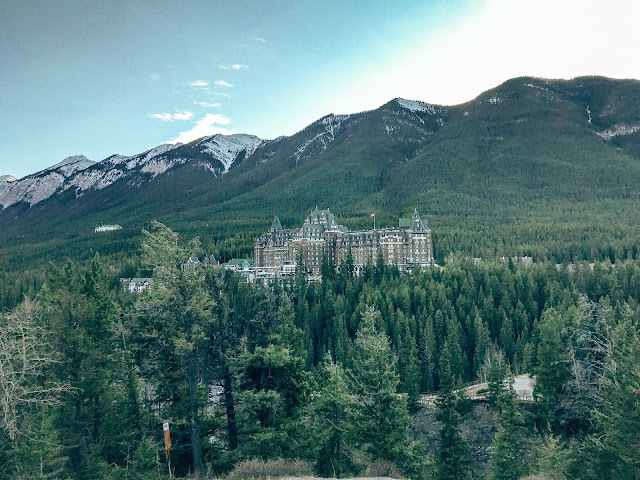 The perks of a road trip are being able to carry as much stuff as you want (no weight limit) and going wherever your heart desires (because... you have a car). Since I wanted to plan a summer vacation around camping and hiking, a road trip made the most sense. 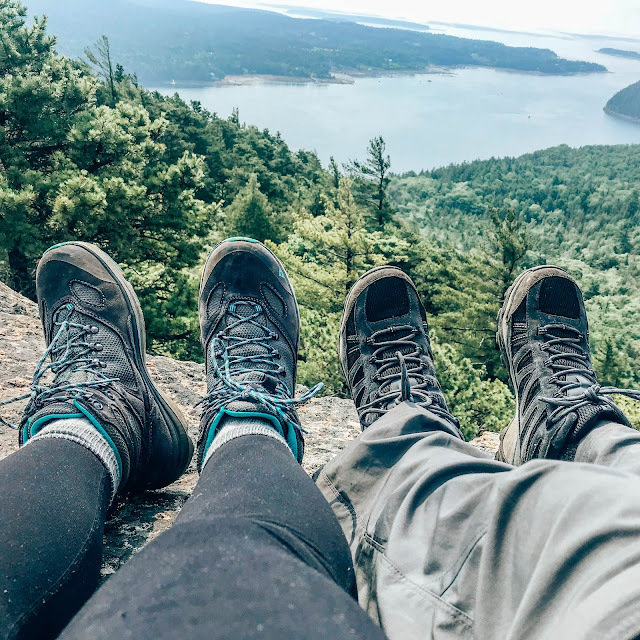 I love the mountains and my boyfriend Mike enjoys being by the water, so Acadia National Park was an easy choice to please both of us. 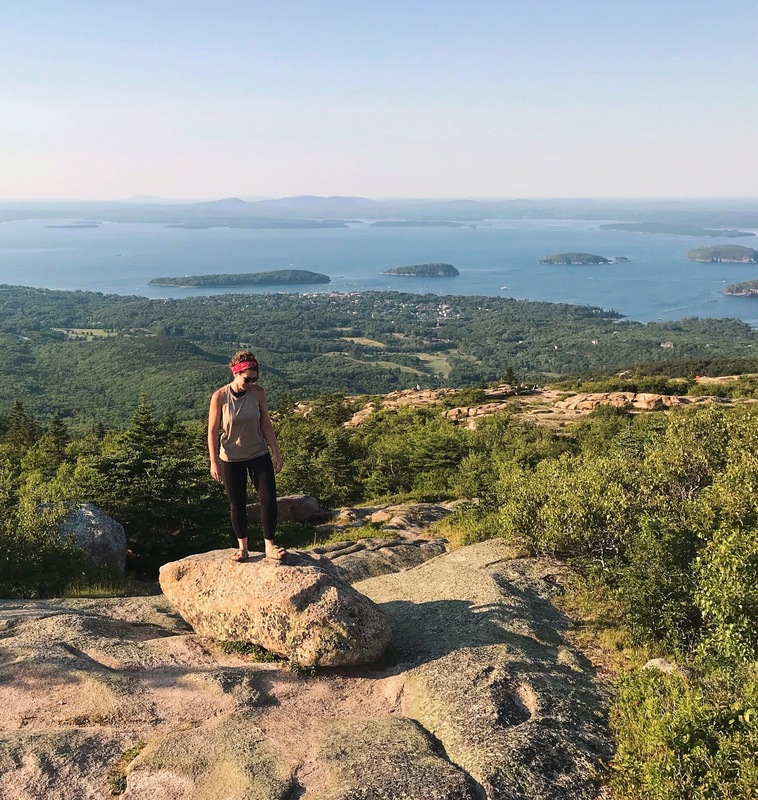 We planned our trip with Acadia in mind but while we were looking for other places to stop along the way, I saw a big green area on the map in New Hampshire and we decided to check it out. Somehow I wasn't aware that White Mountain National Forest is a gorgeous mountain range with the highest peak in the northeast. 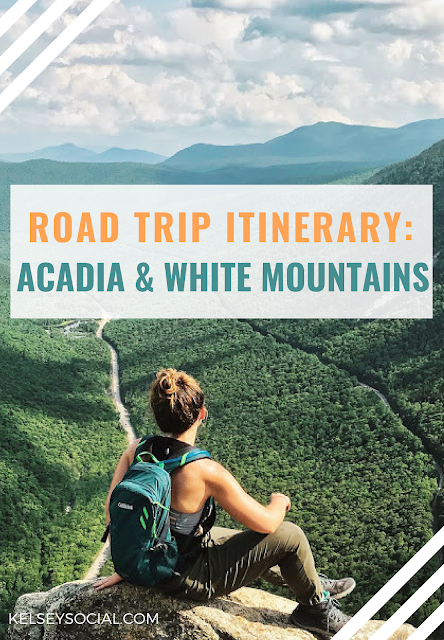 Keep reading for the entire itinerary of our eight-day road trip from Virginia to Acadia and back with a few great stops along the way. The day began at 6 AM when Mike and I left his house in Fairfax, Virginia. We drove ten hours (ugh! traffic was bad) to Hartford, Connecticut for a brief stop to pick up food and supplies and continued the last hour and a half to our destination. When we reached White Mountain National Forest in New Hampshire, we popped into the visitors center to purchase a trail map before checking into Maple Haven Campground for the night. The long drive wore us out, so we set up camp, took a little walk along the river, cooked chicken with onions and sweet peppers over the campfire and went to bed. The morning began with campfire eggs, onions and sausage with avocado on the side. We packed up camp and went to the Falling Waters Trail for a little morning hike to see a couple waterfalls. For lunch, we made turkey avocado wraps on a picnic table near Willey House Pond and relaxed before our hike up Mount Willard. It was a steep trek, but the views were absolutely incredible. The day was fading fast, but we wanted to do one last hike to a waterfall recommended by the visitor center's staff. The hike to Arethusa Falls was another short but steep one. Since we didn't have much time, we really pushed ourselves and made it to the falls in about 35 minutes. And... WOW! I hadn't looked up pictures or reviews of Arethusa Falls, so I had no idea how big and beautiful this waterfall is. If you go to White Mountain National Park, you should most definitely end your day with a visit to this waterfall to swim in the pools at the base. 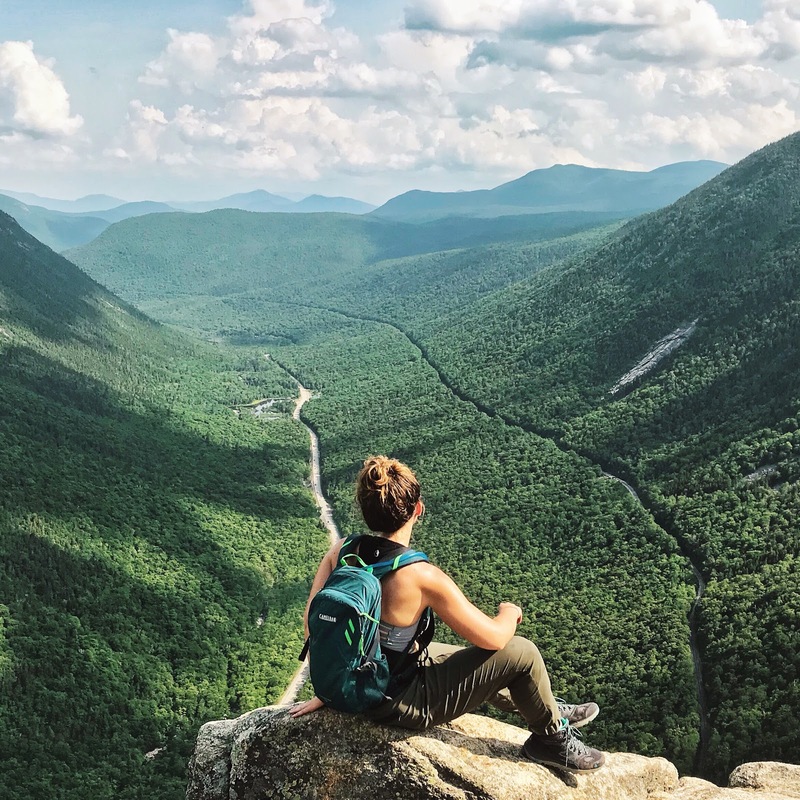 Mike and I were so thrilled that we added this hike to our day in the White Mountains! We got back to camp pretty late and were too exhausted to cook dinner. Mike ate a can of ravioli and I made a bag Backpacker's Pantry Corn Chowder. Not glamorous, but we didn't go to bed hungry. A day that was equal parts sad and exciting. While we were eager to see Acadia National Park, we loved White Mountain National Forest and did not want to leave. Since we had a nonrefundable campsite in Acadia already booked, we woke up early, ate a couple hard boiled eggs and protein bars and drove North to Maine. We stopped in Augusta to eat lunch and replenish our supplies. When we arrived at Quietside Campground on Mount Desert Island, we quickly set up camp and got back in the car to explore. We checked out the Bass Harbor Head Lighthouse then I walked around Fernald Point while Mike did some fishing there. Back at the campsite, we made a delicious salmon dinner with roasted potatoes cooked in the cast-iron skillet over the fire. And, of course, had s'mores for dessert. Another morning of packing up camp and hitting the road. By this point, we'd gotten really good at setting up and breaking down our campsite quickly and efficiently. We ate protein bars for breakfast and got an early start on the Acadia Mountain Trail. 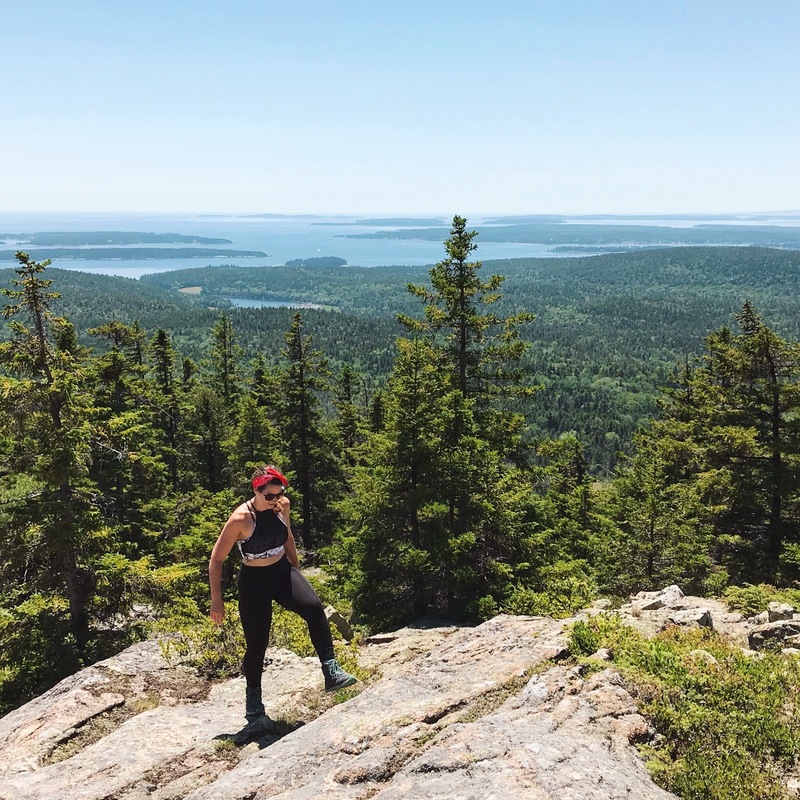 This hike is a good option on the western side of Mount Desert Island and offers great views of Sommes Sound. I'd suggest going early like we did. As we were finishing our hike, we passed quite a few groups just getting started. But the best part of the morning was the reward after the hike. Directly across the street from the Acadia Mountain Trailhead and is a short path to Echo Lake Ledges. At the beginning of the trail, there's even a bathroom where you can change out of sweaty hiking clothes and into a bathing suit. 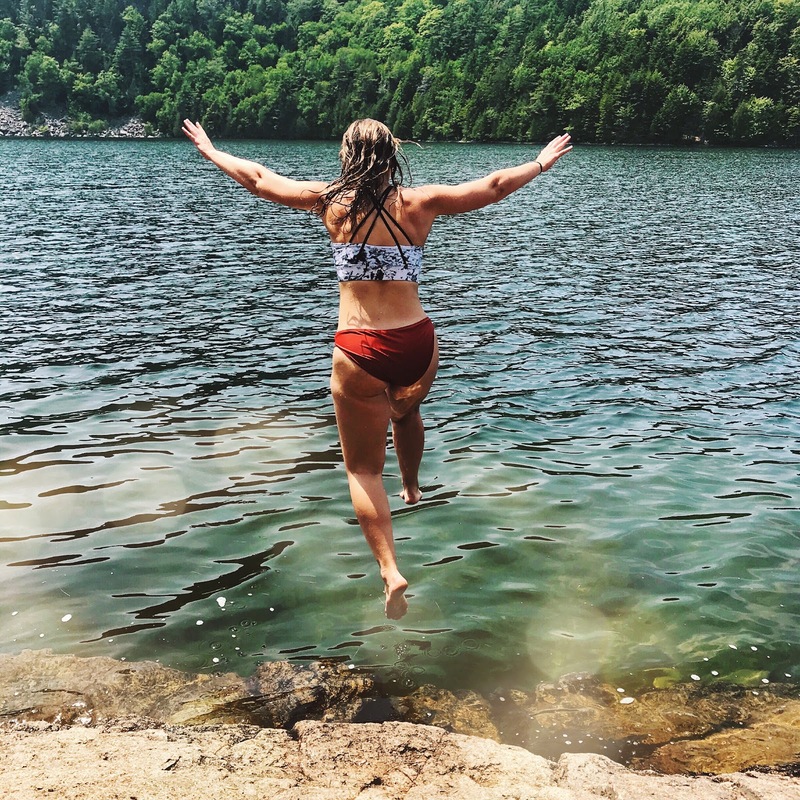 Jumping from the ledges into the water was so refreshing after a hot July hike, but the best part was that we had the whole spot to ourselves (we didn't get so lucky on our second visit to the ledges). We checked into Hadley's Point Campground and set up camp, ate turkey wraps for lunch, and relaxed in the shade during the hottest part of the day. This was the biggest and busiest campground, but since we were only around camp to eat and sleep, we didn't mind. Later in the afternoon, we hiked the Beehive Loop Trail and it was so much fun! Seriously. I think I had a smile on my face the whole time. My adrenaline was rushing as I climbed the iron rungs and crossed narrow bridges to get to the top. At the summit, we took in great views of Acadia, The Bowl, Sand Beach, and the ocean. We continued down the loop to The Bowl, a clear mountain pond, for a swim. After the loop, we walked to Sand Beach for some time by the ocean... the freezing cold Atlantic Ocean. It was too cold for me to swim, but there was soft sand and nice views. When leaving the beach, it started to rain and we caught a gorgeous rainbow at the south end of the island at Boulder Beach. For dinner back at camp, we roasted sausages and potatoes with a side salad... and a couple s'mores. We woke up in the morning feeling so relaxed because we didn't need to pack up camp! This was the only time on our trip that we were sleeping in the same place for two nights, so we used our extra time to cook a big breakfast over the campfire: bacon, eggs and sauteed onion with avocado on the side. I'd heard good things about Jordan Pond, so we set out to hike the loop around the pond and quickly realized that it wasn't going to be enough for us. It's a nice stroll, but we were used to getting our hearts pumping and sweat pouring each morning so we changed plans and hiked the nearby Pemetic Mountain. I didn't know what we were getting into or how long this hike was. I saw the trailhead listed on the map and Mike said: "Let's go." This four-mile loop was a rugged climb on open face granite with the sun beating down on us. We said we wanted a sweat. Well, we got it! 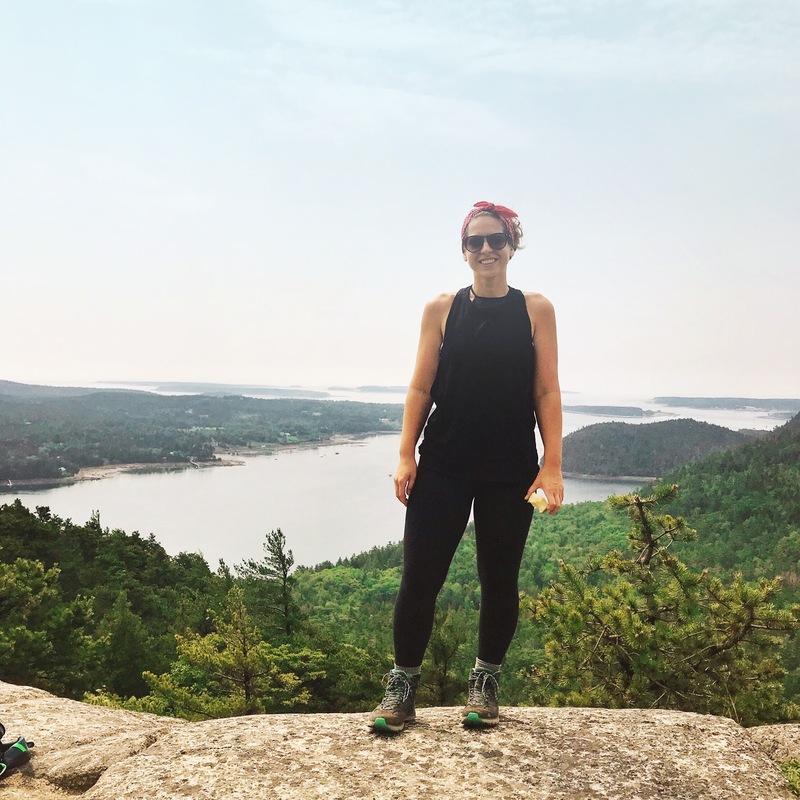 I did love this hike and especially enjoyed the panoramic views of Jordan Pond, the ocean, and the surrounding islands. I was quite exhausted after the Pemetic Mountain Loop and ready to reward myself. We scarfed down bacon turkey wraps back at the car and then visited the infamous tourist attraction of Jordan Pond House for the popovers. We didn't know what popovers were, but were told we needed to try them! A popover is a light hollow roll served with butter and jam. While you can never go wrong with bread and jam, I don't think Jordan Pond House as a must-do on your Acadia itinerary. The popovers were good, but definitely overpriced and not worth the hype. Our campfire food was much better! Then, we wanted to go back to our favorite place for a swim... Echo Lake Ledges. Take my advice and go to these ledges instead of the crowded Echo Lake Beach. There are limited options for swimming in Acadia, and this is one of the best! After our swim, we drove up Cadillac Mountain for the sunset. At 1,530 feet, it's the tallest mountain on Mount Desert Island and the highest point along the North Atlantic seaboard. Many people head here for sunrise, but I'm not that much of a morning person so we opted for sunset instead. It's also a popular hike, but since there's an option to drive to the summit, hiking Cadillac Mountain was less appealing. I preferred hiking to summits in the park that can only be reached on foot. We snacked on pepperoni and wheat thins, drank a spiked seltzer and watched the sun go down behind the mountains. It was the perfect end to our time in Acadia. We woke up and made our final campfire meal: eggs, onions, and potatoes in the cast iron. I really miss these meals. There's something special and more rewarding about eating a meal cooked over a fire you built yourself. We packed up the camp for the last time and drove south. Our first stop was Red's Eats in Wiscasset. The roadside stand is known for the best lobster rolls in Maine so I was set on trying one. Mike wasn't too happy about standing in the hour-long line in the sun, but we were committed. The lobster rolls were $25 a piece and piled high with big chunks of fresh meat on a buttered, grilled New England–style hot dog bun. They were absolutely delicious. The fried shrimp we ordered as a side was also amazing. I'm glad we went, but would I wait in the line again? Honestly, probably not. I recommend you try it out for yourself, but I'm sure there are lobster rolls found elsewhere that are just as good with less of a wait time. After lunch, we stopped in Freeport to visit the L.L. Bean. Flagship Store. I had no idea that this was more of a campus with four other L.L. 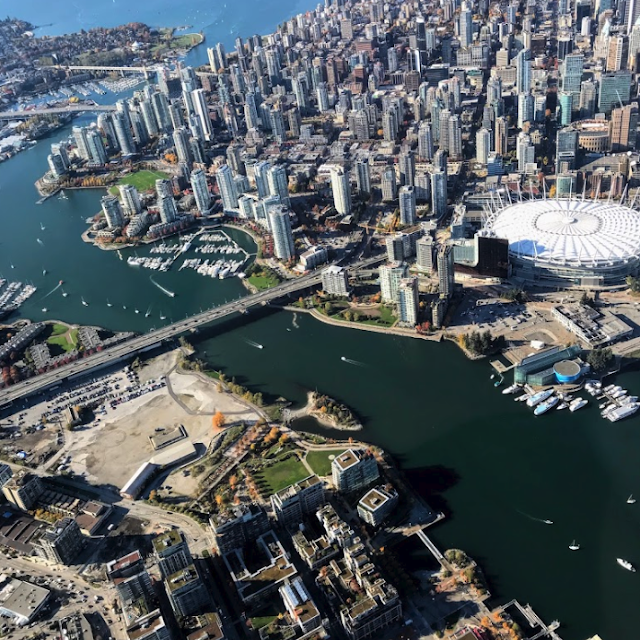 Bean stores: Home, Outlet, Bike, and Boat & Ski stores each have their own buildings. If you go, don't skip the outlet store for the best deals. Eventually, we arrived in Portland and checked into the Westin Portland Harborview for a luxurious night of hotel life after five nights of camping. We walked down the road and stumbled upon live music, pizza and beer at Slab and needed nothing more... well, until we realized we also needed Beal's Old Fashioned Ice Cream. Try a scoop of the Maine blueberry! We woke up to a gloomy day in Portland so when the hotel offered us free room service breakfast (due to making us a wait an hour the night before at check-in), we gladly accepted. We then checked out the Portland Head Lighthouse and endured the drizzle while wandering some of the trails in that area. Next stop: I really wanted to see the beach. We drove along the shore and eventually found free parking at Ferry Beach. This was the perfect little beach for a short walk along the water while watching fishermen dig for clams. Back on the road, the sun was finally starting to shine by the time we pulled into the little town of Kennebunk. We had a good seafood lunch at Allisson's and walked around town to check out some of the beachy shops. If I were to do it over again, I would've scheduled a whale watching or lobster boat tour for this stop on our trip. That evening, we redeemed my free night as a Marriott credit card holder at the Fairfield Inn in Amesbury, but we drove the 20 minutes back into Portsmouth, New Hampshire for dinner. We settled on beers and a meal at Portsmouth Brewery. They're known for their mussels and they were delicious! Sadly, this was the last day of our trip. We woke up, had continental breakfast and hit the road for a nine-hour drive back to Virginia. Overall, I am so happy that Mike convinced me to take a road trip for our summer vacation. Because we camped, cooked most of our meals, and used hotel points, the trip was relatively inexpensive. 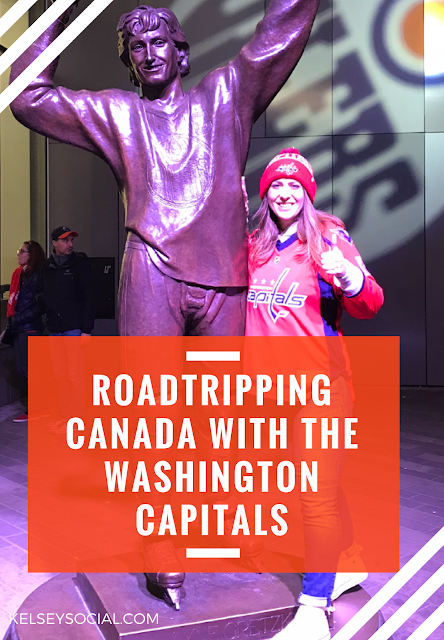 We spent less than $1,000 altogether (gas, tolls and lobster rolls were some of the highest expenses!). Did I miss any good stops on the trip? Please tell me! I'd love to redo this vacation another time and I highly recommend you recreate it for yourself! I never turn down an opportunity to visit a new place. That's why I visit people in different cities, tag along on friends' business trips, and try to make the most of my own work travels. I have no intention of "quitting my job to travel the world" or "quitting my job to become a full-time blogger" (I see these blog post headlines way too often), so I'm a big advocate for #WeekendWanderlust and maximizing your travels while maintaining a standard nine-to-five. 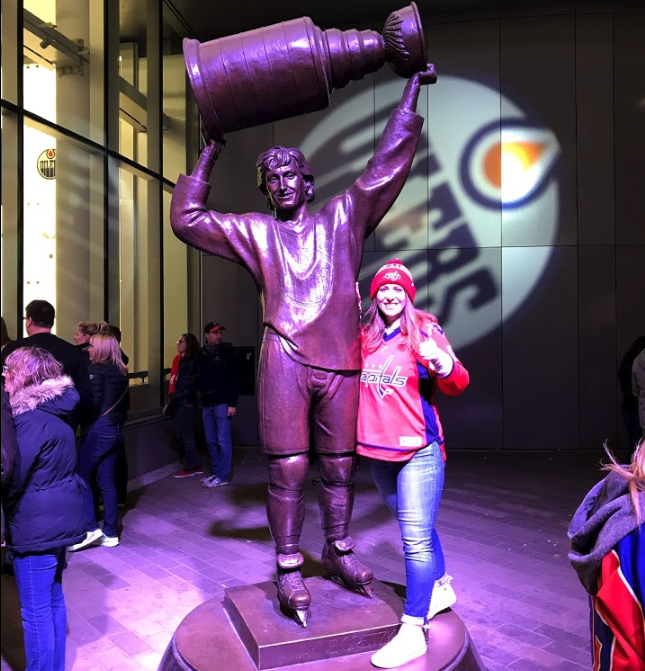 I get the opportunity to travel for work a few times a year, so when I learned I was going to Nashville, I knew I had to make the most of it. Two days before I left, I asked my friends/followers for their recommendations and I received so many responses! As I normally do when visiting a new city, I created a Nashville map in google and tagged all of the places they mentioned. This time, I'm sharing the Nashville map with you to reference on your next trip to Music City, U.S.A. I've broken my weekend up by the four neighborhoods I visited. I did a lot of eating, shopping, wandering and mural hunting in each of them: Downtown, 12 South, East Nashville and The Gulch. I was working a conference at the Music City Center, so I stayed within walking distance at the Sheraton Grand Nashville Downtown (I always book SPG and Marriott hotels to maximize my points!). The hotel was nice. I loved the glass elevator overlooking the lights in the lobby, but I wouldn't choose this location unless you need to be in this neighborhood. However, the free shuttle to whisk guests around the downtown area was a good perk of staying here! In the mornings before work, I enjoyed stopping at Frothy Monkey. The coffee shop was close to the hotel and they make a great latte and serve quick breakfasts. While in Tennessee, I had to get barbeque. Martin's Bar-B-Que Joint is massive with GPS trackers that show food runners where you're seated. Don't let the line intimidate you, there's plenty of seating inside. Order a Redneck Taco and head up to the Beer Garden and Upstairs Bar for the best atmosphere. If you have any room left in your stomach after Martin's, stop by Mike's Ice Cream. This old-fashioned ice cream parlor has classic and unique flavors - like banana pudding and blackberry cornbread. One evening after work, I took the recommendation from my Lyft driver, who was not a fan of the bars on Broadway, and stopped into Gray & Dudley for a drink and appetizer. If you're looking for a unique atmosphere that's far from the honky-tonk theme, stop in here. It was the perfect place for a solo drink with some people-watching at the bar. If you're hungry, I recommend the seared octopus. Before you leave, visit the free contemporary art galleries in the attached 21c Museum Hotel. 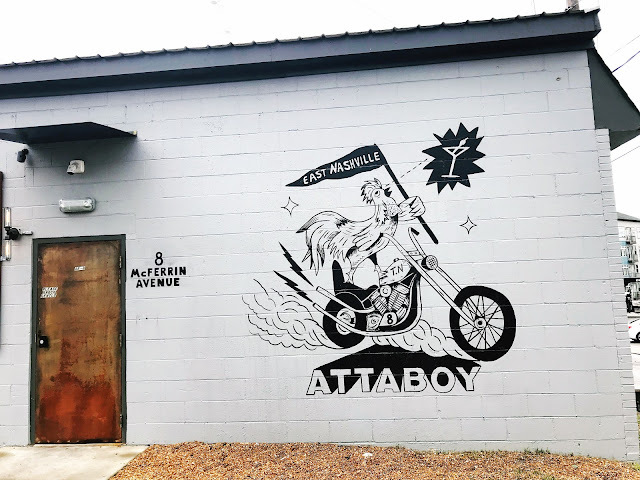 I wandered around East Nashville one afternoon and fell in love! When I go back, this is the neighborhood I want to explore more. It's further from downtown and more spread out but has good shopping and so many restaurants to try! A few of the favorite shops I stopped in were Hip Zipper for fun vintage finds, Project 615 for Nashville-inspired graphic tees, and Lemon Laine for natural beauty products. I grabbed a quick lunch at Mas Tacos. It's a cool, quick-service spot that's cash only. I ordered a deep-fried avocado taco with chicken tortilla soup and a pineapple cilantro agua fresca. Yum! This is a neighborhood not to skip. Plan a brunch, lunch or dinner here with plenty of time to browse the shops and see the murals. 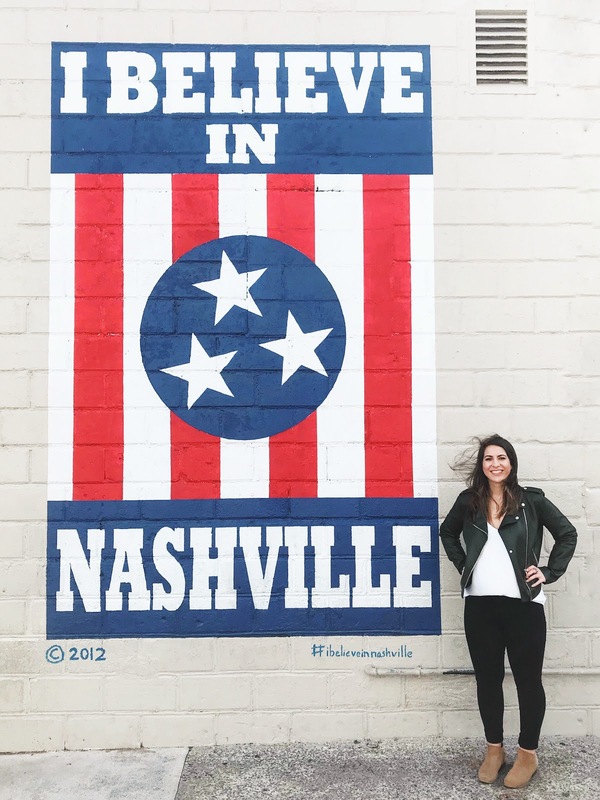 I've listed the locations of the murals on my map: I Believe in Nashville, Draper James Stripes, Make Music Not War, Flowers at Green Pea Salon and Tie Dye Nashville at Corner Music. As for shopping, your first stop should be White's Mercantile. Browse the accessories and home decor in the modern-day general store. Pick up a bar of Olive & Sinclare chocolate or rainbow bark from Bang Candy Company - they make for great gifts! Other shops to visit are Serendipity (cute gift shop with local goods), Draper James (Reese Witherspoon's clothing line) and Savant Vintage (for vintage stuff, duh!). Before leaving this area, I stopped in Five Daughters Bakery for a lemon blueberry doughnut. The doughnut was delicious but the bakery is worth a stop just for the decor and colorful patio. Bonus: they have vegan and paleo option! Craving something sweet other than a doughnut? Jeni's Splendid Ice Cream and Las Paletas are both close by! I originally went to The Gulch to visit the tourist hotspot Biscuit Love for breakfast. The line was out the door and my time in Nashville was ticking, so I wandered into Barista Parlor instead. I am so glad I did! My latte was delicious and the bacon, egg and cheese sandwich was simple but perfect. I loved the open atmosphere and enjoyed people watching in this space. After breakfast, I wandered around the neighborhood a bit admiring more street art and did a little window shopping before stopping at Two Old Hippies. It's a guitar store with unique gifts and books and also some great clothes and boots. I could've walked away with a lot more than just the matchbox I bought for a souvenir! My final stop in The Gulch neighborhood was to get a photo with the Kelsey Montague wings. 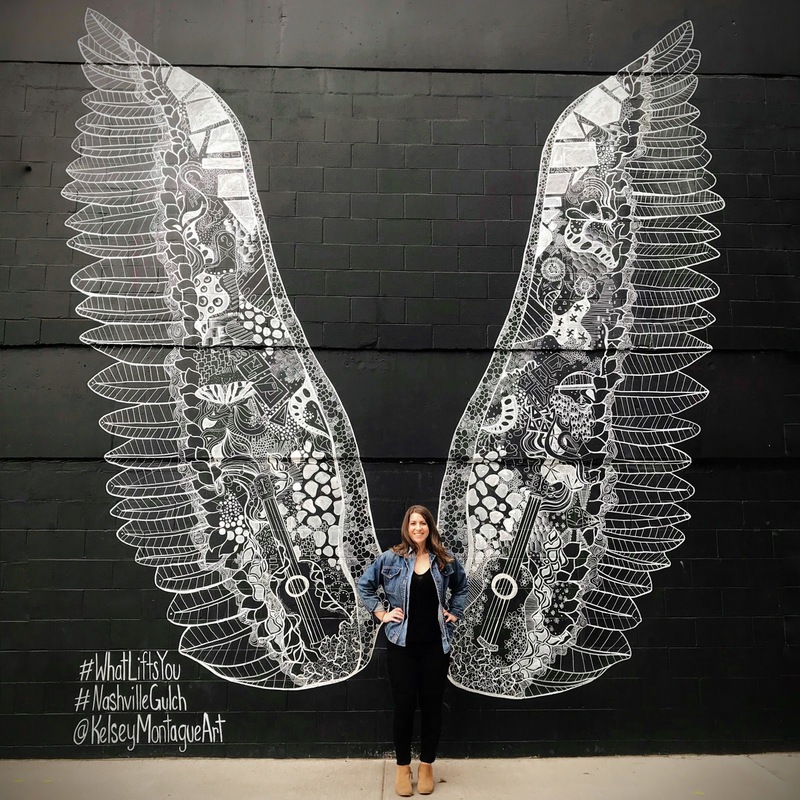 I've seen @KelseyMontagueArt in a few cities now and I love how her work reflects the different locations. See the guitars and cowboy hats in this one? Just be prepared for a line when you stop by. 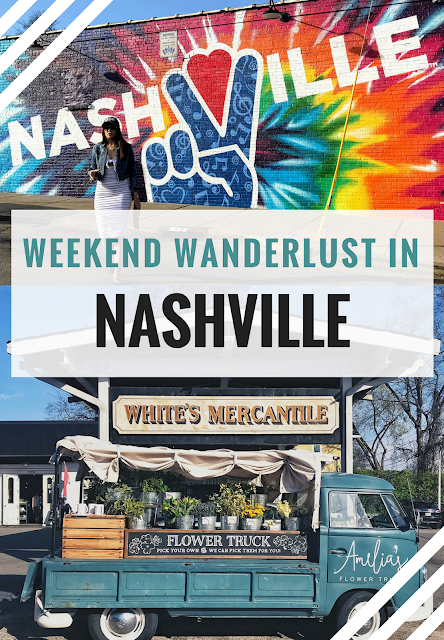 Don't forget to check out my map of Nashville for the places I've mentioned here as well as more recommendations from my friends and followers. Let me know of any spots that should be added to the map to complete the perfect weekend in Nashville!